The first rail link between Thailand and Laos has recently opened and will offer four services daily across the Mekong River. 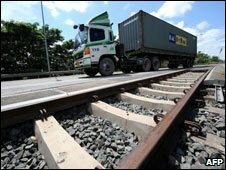 The 3.5-kilometer track connects Thailand’s Nong Khai province and Laos’ Tha Naleng station and will be extended further to the capital Vientiane in the near future. The 197 million baht (about US 5.4 million dollars) project was financed by Thailand. The Laotian government plans to build further links to Luang Prabang and to Boten near its northern border with China. The services are expected to ferry around 500 passengers across the Thai-Lao border every day. The fares for the 15-minute journey vary from between 20 and 80 baht. Passengers who do not have a passport can obtain a temporary border pass from officials at the border checkpoints.